When I think of PerumAL, I also recall the PuLiyOdharai special of the Iyengars. Why can’t we have this for today’s posting? PuLiyOdharai is one of the chithrAnnams we prepare for Kanu, the next day of Pongal festival and Adi 18 (PadhinettAmperukku). Those who are near the river KavEri, used to carry it for a picnic to view its flooding water on this day. 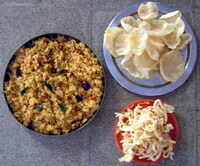 PuLiyOdharai is the rice mixed in PuLikkAichchal. 2 tsp Here tbs indicates Table spoon and tsp teaspoon. Roughly 1 tbs is equivalent to 3 tsps. The tamarind taken is of a big lemon size. *Never use Tamarind Paste available in the shop. To prepare PuLikkAichchal, first clean the sesame seeds, roast and powder. Then roast fenugreek and asafoetida separately, powdering fenugreek only. (Solid asafoetida is preferable and if you use it, then you need to roast it and powder). Place the tamarind in two cups of hot water, allow a few minutes to open up and extract the juice. Strain for any impurities. Keep about 2-3 table spoons of oil in a KadAi and fry red chillies and coriander seeds, powder coarsely in a mixie and keep aside. Now pour the remaining oil in the kadAi and when it becomes warm, add mustard seeds to it. When they start spluttering, add Bengal gram, Black gram, Ground nuts and Curry leaves. Sautee for a few seconds till they release a nice aroma. Add tamarind juice, turmeric powder, and roasted fenugreek and asafoetida powders. After 2 minutes, add powdered red chillies, coriander seeds, sugar and salt. When it becomes a thick mass and does not stick to the side with oil floating, remove from the flame. Now add roasted sesame powder to it and mix well. In PuLikkAichchal, the oil should separate from the tamarind mass and float over the boiled thick mass so that it can be refrigerated for some time, say for a month at least. When you want to make PuLiyOdharai, cook the required rice; spread it in a big bowl, adding 2 table spoons of pure sesame oil. Then after some time add the PulikkAichchal as much as you require for your taste. If you need a bit more salt, you can add. PuLiyOdharai goes well with fried VadAms (Fryums). Note: (1) Some prefer to add the fried ground nuts after they mix PuLikkAichchal with the cooked rice so that they remain crispy. (2) If you do not get hot chillies, then you can increase the pieces to your taste. In spite of all care, there are occasions, when due to a bad gasket or improper closing of the lid, there is leakage of steam which results in drying of water completely and staining the bottom of the pressure cooker brownish black. To prevent this, you can place a few peels of lemon or, if unavailable, a little quantity of tamarind at the bottom of the cooker along with the water while cooking. This entry was posted on February 21, 2011 at 7:02 am and is filed under PuLiyOdharai with tags Adi 18, asafoetida, Bengal gram, Black gram, chana dal, chilli, chitrannam, coriander, curry leaves, ellu, fenugreek, gingelli, ground nut, kadalaipparuppu, kadugu, Kanu, manjal, milagai, mustard, nallennai, nilakkadalai, oil, Pathinettam perukku, perungayam, puli, pulikkaichal, Puliyodharai, puliyogarai, red, salt, Sautee, sesame, sugar, tamarind, til, turmeric, ulundhu, uluththam paruppu, urud dal, vatral, vendhayam, verkkadalai. You can follow any responses to this entry through the RSS 2.0 feed. Both comments and pings are currently closed. Please let me know if the above recipe has given you a good end result. Sure Amma, Will try sometime this week /weekend and will let you know when we talk ! !